This could be the last pair of hoof nippers you will ever buy! 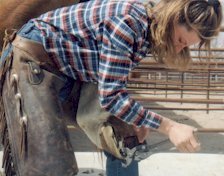 Wyoming resident & accomplished farrier, over many years, envisioned a new & improved hoof nipper. A farrier tool that did the muscle work on those hard to nip animal hooves. 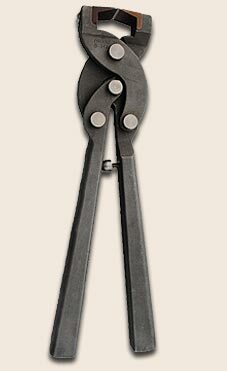 The unique tool was promptly named "Bud Nippers". You'll fi nd his name burned into every pair. "Bud Nippers" are made with the finest material, & incorporate the unique features found in no other nipper available on the market today! *Click on circles to view larger pictures. Replaceable blades made of stainless steel make these nippers a ONE Time Purchase. 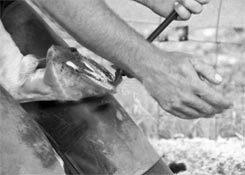 The unique compound leverage allows the force at the blades to be approximately 18 Times Greater than that applied to the handles. The adjustable stop allows for precise repositioning of the cutting edges during sharpening & normal wear & tear of the replacement blades. SET SCREW: The tiny set screw found in the back of the handle allows for movement of the adjustable stop. We have decreased the handle size of the "Standard" Compound Leverage Nipper" to fit your hand more comfortably, without compromise. The nipper has acquired a nice overall slim line appearance. The overall length of the nipper is 13.5 inches. The "Bud Nippers" are made of 100% stainless steel, thus preventing any rust or corrosion. "Heavy Duty - Compound Leverage Nipper"
Trimming horses is a big job, so when you go to work, take a tool that keeps you at the top of your game. • No More Down Time! • No More Dull Nippers! What the customers are saying!!! We were able to finish a very difficult trim job less than 1/4 the time, and still had energy to burn!" "...the bud nippers are fantastic, I have a horse with hooves like concrete and my new nippers cut through them like butter!" "...these nippers are really a quality built piece of equipment!" "...this a good product that I strongly recommend ! Thanks for the nippers they are a great tool!" 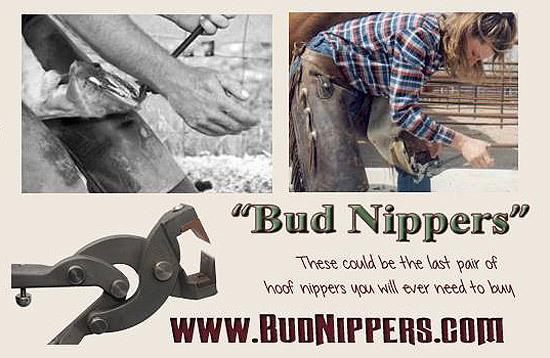 Bud's Horseshoeing Equipment, Inc. & BudNippers.com. All rights reserved.